A couple of days ago I was speaking to some friends about the jaguar that escaped from his cage and killed a man in Belize on October 24, 2010, during Hurricane Richard. They were shocked to learn that this beautiful animal was put to sleep last Tuesday, October 26th. The jaguar escaped when a tree fell on his cage during the hurricane. He went on the loose and killed 47 year old Bruce Cullerton. Cullerton was found a few feet from his property gate with fatal bites to his neck, head and hand. CNN originally reported that the jaguar was from the Belize Zoo, but it turned out that he was being raised on the private farm of Richard Foster, an internationally renowned British nature photographer who lives down the road from the Belize Zoo. Mr. Cullerton is the next door neighbor of Richard Foster, who has been keeping this jaguar at his farm for years. Even though this animal was put to death, first and foremost to protect the lives of humans, the question remains as to why the animal wasn’t turned over to the Belize Zoo. I think it is wrong to keep an animal like this locked up in a small cage as a pet. It is clear to see that this animal was never tamed. 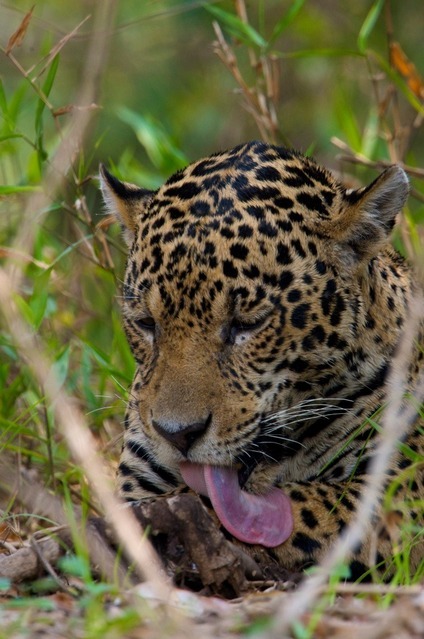 Do you think that jaguars should be allowed to be kept as pets in Belize, or anywhere for that matter? Someone has lost their life, but it is horrible that this animal was put to sleep. Who is to balme here? THE VIDEO BELOW GIVES YOU AN EXPLANATION FROM THE OWNER OF MAX, THE JAGUAR OF WHAT HAPPENED. I DONT think they should have killed the jaguar. It was only acting on instinct. This is what happens when man feels the need to tamper with the wild. It shouldnt have been caged in the first place. There are so many other things they could have done instead of killing it, like trying to relocate it. This is a dumb animal we're talking about here that cannot say anything for itself as to what happened. For all we know it was probably aggravated and acted in defense, because for sure it wasnt hungry as it left the man's body where it was. I strongly disagree and I think some people need to stop playing God and STAY OUT OF THE WILD!!!! Yes indeed Eva!! So sad that both a human and the animal lost their lives. Wild animals should not be kept in cages period; this is like a prison. It is very clear that this animal was not out to terrorize the surrounding communities. Like you said, he should have been relocated. The person that chemically induced the animal is a University of Florida student working on his PhD in Belize, but it was a Belizean Vet that put him to sleep. This is a horrible story, CNN should re-tract their story and get the facts as they are. I do not think it should have been killed either. Killing it serves no purpose. It is not punishinment because he did not know he was doing wrong. Just a dumb animal that was probably scared by a storm that most of us experienced for the first time. I think that the only reason that the animal attacked that man is because the animal felt threatened by the man. No one knows what happened out in that jungle that night; I think that wildlife biologists should have stepped in to save the animal. Before you place your story on the web there are some facts you needed to get straight. His surname is Cullerton. Also Foster is British not American. Before you start to incite people about the merits of killing the jaguar to try and increase readership, you need to know all the pertinent facts. Thanks you very much for visiting and reading my blog. There were 74,000 articles written on this story and so many writers got it wrong. CNN got the story confused, the US Embassy got it wrong, etc, etc......Every journalist and writer try to do the best that they can to be accurate. I have since made the correction and I appreciate your readership. I'm genuingly interested in the opinion of my readers and my only goal is to bring news about Belize to a wider audience. I appreciate your comment and please do continue to read my blog. If anyone should be put to death it is the owner of the jaguar who keeps these beautiful wild beasts in cages. The jaguar was just doing what wild animals do, acting within the law of the jungle. You are absolutely right Jenny. I hope there are no more jaguars in captivity in Belize.